This 4 day work week was booming with new faces at Fuse. Whether it was day passes, or hot desk memberships, we loved getting to know new people and helping them find their home in Fuse. We have done 4 tours AND 3 day passes. 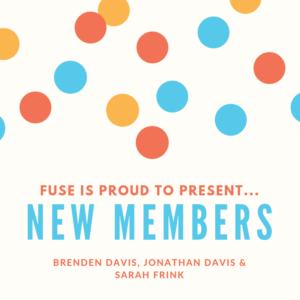 Along with that, Fuse is thrilled to introduce our new members… Brenden Davis, Jonathan Davis (no, they aren’t related), and Sarah Frink! Are you interested in becoming a member of Fuse, or simply want to know more? Check out our website https://fusespc.com/memberships/ or come in for a tour on any Tuesday from 8-11am, or on any Thursday from 3-6pm!